Echinacea is believed by many to stimulate the immune system and help the body fight infection and has therefore been used for centuries to treat and prevent colds, the flu and other infections. Despite mixed results when it comes to studies evaluating its effectiveness, anecdotal evidence is such that it remains a popular health supplement. Although most side effects are mild, when used for a prolonged period of time or when too much is used there are some potential side effects that, while rare, can be serious. Echinacea that is taken long than eight weeks can potentially damage the liver, according to Columbia University's Health Q&A Internet Service. Increased liver enzyme activity, a symptom of liver damage, has been noted in liver transplant patients who take large doses of echinacea, according to MedlinePlus. 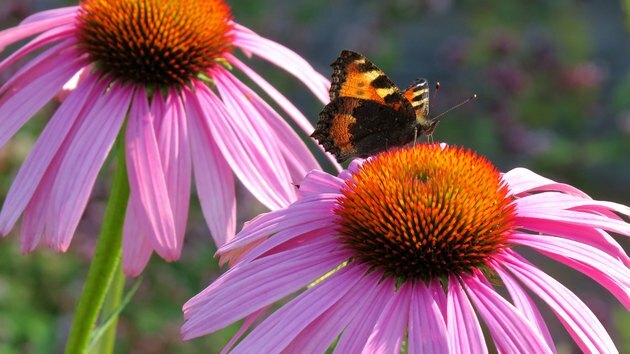 For this reason, liver transplant patients should use extreme caution when using echinacea. The website AskDrSears.com points to a valid concern about echinacea. If one supports the claims that echinacea is effective in tampering with a virus' genetic makeup, then who is to say that any changes that take place could cause viruses to become stronger and more resistant? Much in the same way that certain bacterial infections have grown resistant to antibiotics, couldn't the same rationale apply to echinacea and viruses? Echinacea may have a negative interaction with several drugs, according to the University of Maryland Medical Center. If you are undergoing treatment for cancer, are on immunosuppressants, you need to speak to your doctor before taking echinacea. However, UMMC reports that echinacea interacts positively with econazozle which is used as an antifungal. When used together, fungal infections are less likely to return. Using echinacea without taking a break can diminish or negate any positive benefits that have occurred. A report from Columbia University states that after six or eight weeks echinacea becomes ineffective. To prevent this from happening, CU recommends using echinacea for six to eight weeks followed by a one to two week break.